Today I will focus into Kyocera Brigadier phone. 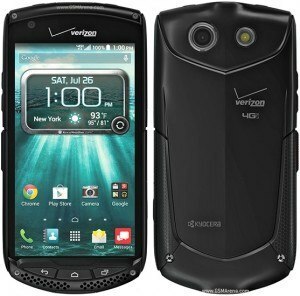 It happens that I own one, purchased from Amazon Store, but I am not a Verizon user (nor plan to be one). This is not your usual reset Android tutorial. The Kyocera Brigadier phone is a really nice macho Android device, rugged up to the point of including a synthetic mineral sapphire screen. Yep, the unbreakable screen technology that all iPhone users where expecting to get on their iPhone 6 and iPhone 6 plus but apparently Apple considered too expensive to add into their design. Only drawback: Verizon has locked the APN options inside the Kyocera Brigadier, hence I was not able to add my own LTE provider’s APN… until now. As it happens, today I had two news, a good one … and just to prove that ying yang concept, a bad one. The good one, which I will blatantly copy (citing the source, all in due time) will make the first part of this article, in the form of a tutorial that will -hopefully- allow you to edit APN configuration on your Kyocera Brigadier. 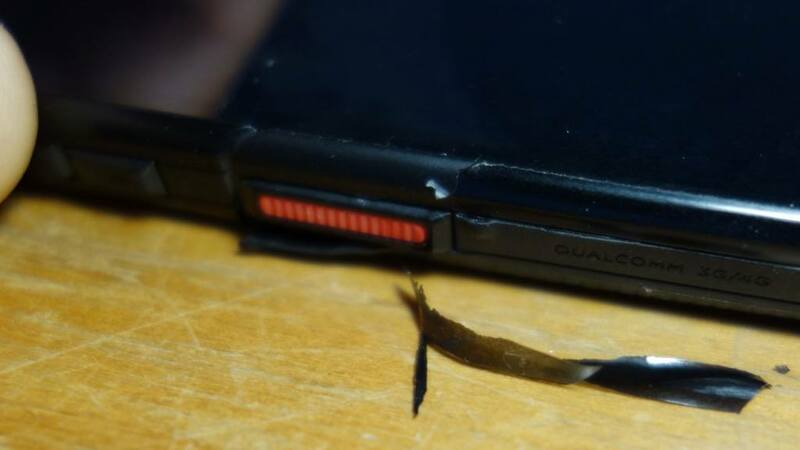 The bad news followed as a realization, when I inserted my nano Sim into the Kyocera Brigadier, that due to a probably forceful-ish insert, I had apparently damaged the Nano slot inside my “rugged” mobile phone. I was shocked to say the least: My Kyocera Brigadier has been transformed into a (not so) rugged brick. 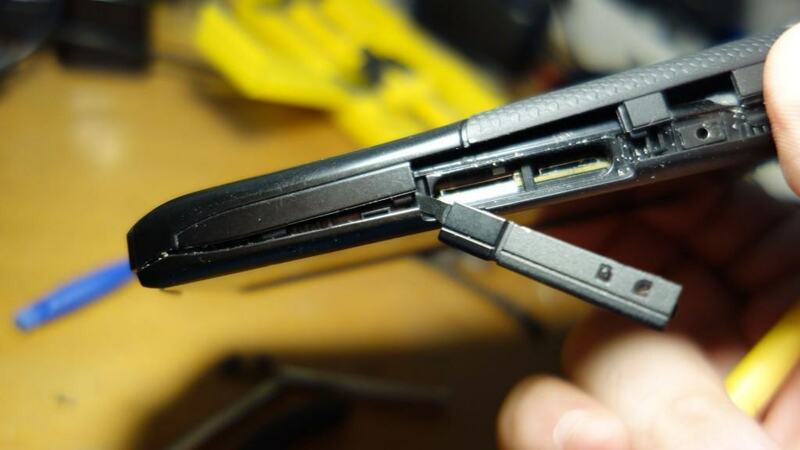 It deserved a disassembly in order to reach the nano Sim slot pins and inspect the damage made. This will be covered in the second part of this article, and it is not for the faint of heart. The following tutorial was originally written by xda-developers forum user buchym and the reposted into this post. It involves blocking the Android apps that are preventing you from editing your APN. Even if this “APN policing” code reactivate later, your already edited your APN and thus it will be kept in working condition. So this may be the safest method of changing your Kyocera Brigadier default APN from Verizon into the one you need. You will need a Windows PC because a windows-only tool, called “Debloater” is needed in order to stop the bloatware and policeware code inside your Kyocera Brigadier. You need to activate the Developer Options on your Kyocera Brigadier: Go to Settings then scroll down to “About phone” and then down to “Build number”. Click on the item 7 times in a row. This will give you the message “Now you are a Developer”. Open the “Developer Options” and activate “USB debugging” option. You need to have the official drivers for your Kyocera Brigadier. You can install drivers from here . Also please ensure your computer correctly detects your Kyocera Brigadier phone. Connect your Brigadier and select Media Sync Mode. IF Verizon software installation pop up appears, cancel it. Use this link in order to download the Debloater software. Install it and skip any eventual warnings of your windows or antivirus. With your Kyocera Brigadier connected and recognized on your PC, Open Debloater software. Check the apps (first column) or processes (second column) that you don´t want to use. When you finish your selection, just click Apply and wait for Debloater to block all services. Disconnect your Kyocera Brigadier and go to Settings > More > Mobile Networks > Access Point Names and you will see in its right corner a plus sign. Tap it, introduce your APN settings and save them. When in doubt, you can check on provider’s website for manual settings. Check on mobile data: Close Wi-Fi and verify you have mobile internet. First let me say that I could not find a single disassembly tutorial for my Kyocera Brigadier on the web. So, I had no idea on where to start. Upon first inspection, I was somewhat freaked out with those really weird industrial type screws on the back of the phone. Now, the front of the Brigadier was another story: I took off the four philips screws from each corner of the screen, which in turn allowed me to take off, making a bit of pressure prying from the screen edge, up and outside; both the bottom tab holding the buttons and the slim top bar. Then I tried the weird screws at the bottom, only to find them being plastic dummy screws, which only served as “rugged” marketing. Below one of them, I could see, at the side, a rusted out philips screw. But since it was definitely NOT below the dummy screw, I started suspecting that there was more to it than keep unscrewing things. 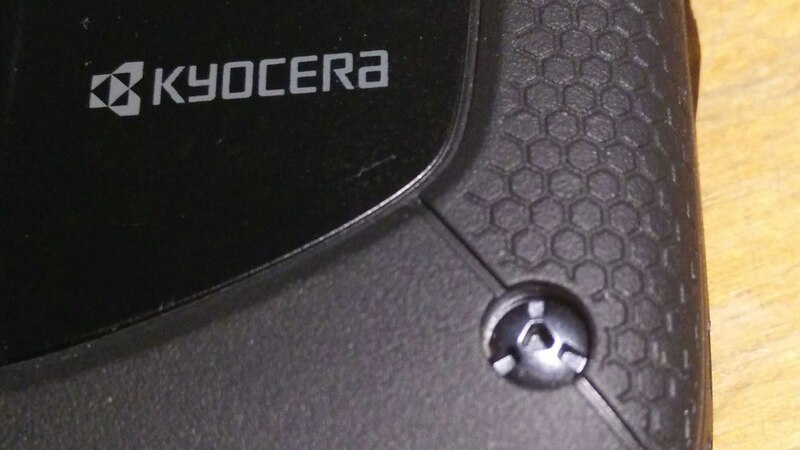 Hence I inserted a small screwdriver horizontally, into the hole that was left from the dummy weird screw, only to find that below the exterior back case of your Kyocera Brigadier, there is another case, being the external one glued into the one below. I applied some pressure and managed to peel out the back outer case, or “marketing shell” from my Kyocera Brigadier. The second shell had six philips style screws (two of them really big ones). I proceeded to unscrew them, and then with a plastic case opener tool, I proceeded to open the inner casing, which was also glued (but included some snap-ons at different intervals). This required some nerves, as I did not have the faintest clue about how much force needs to be applied. Needless to say this whole opening task left some serious dents and scratches on my new -but useless- Kyocera Brigadier phone. 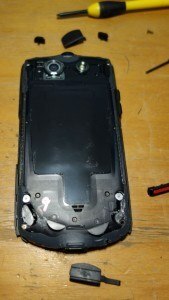 As I said at the beginning this whole Kyocera Brigadier disassembly process is not for the delicate or faint of Heart. Finally, I was “inside” the phone. 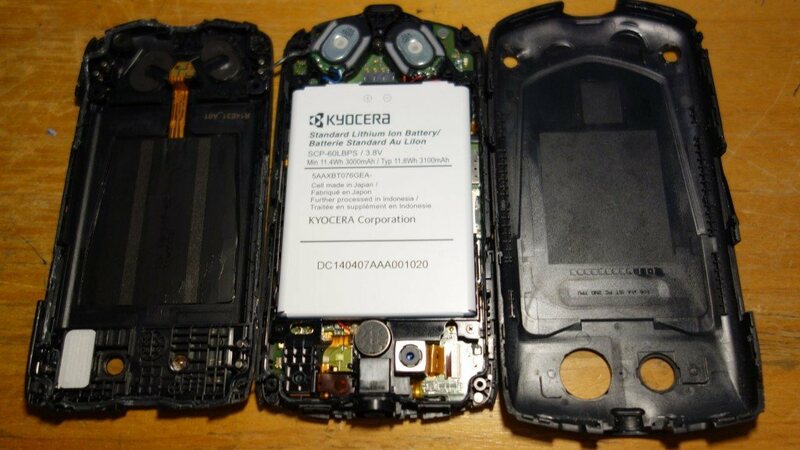 The battery is not wired into the phone’s motherboard, but it rather makes contact with pressure bronce style contacts, as if the Kyocera Brigadier carries a design from an earlier phone with a removable battery. 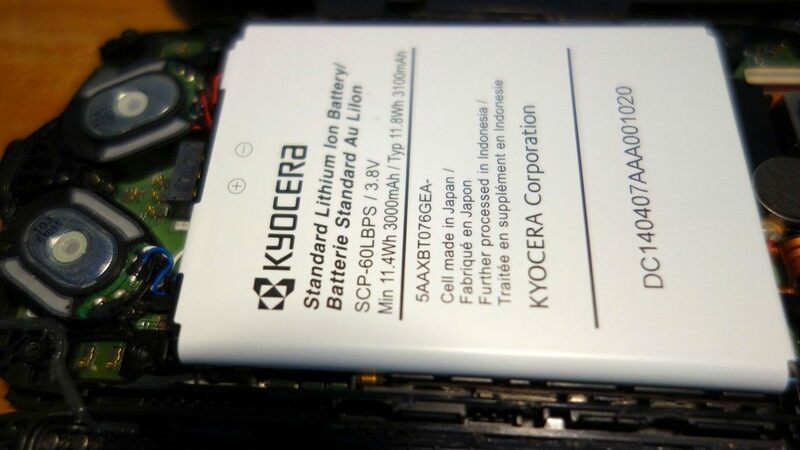 The battery is Kyocera branded, “made in Japan”, model SCP-60LBPS and delivers 3100mah on 3.8Volts. On the back of the inner case I found the NFC – QI wireless charger receptor, carrying the TDK brand, model 18F3-NF-K2. Again, no wire connecting the back case into the screen side (mainboard), only four pressure contacts. 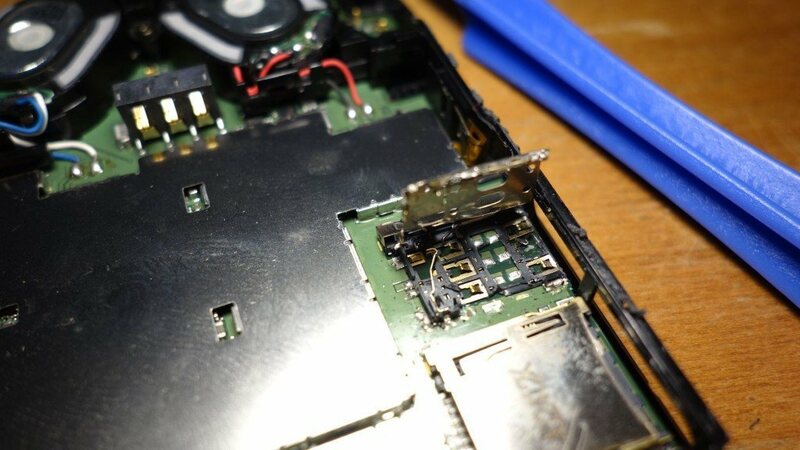 Finally I got to desolder the nano sim slot metal casing, in order to reach the bronze-like metal pins that I very much suspected I had broken when inserting my Nano sim. 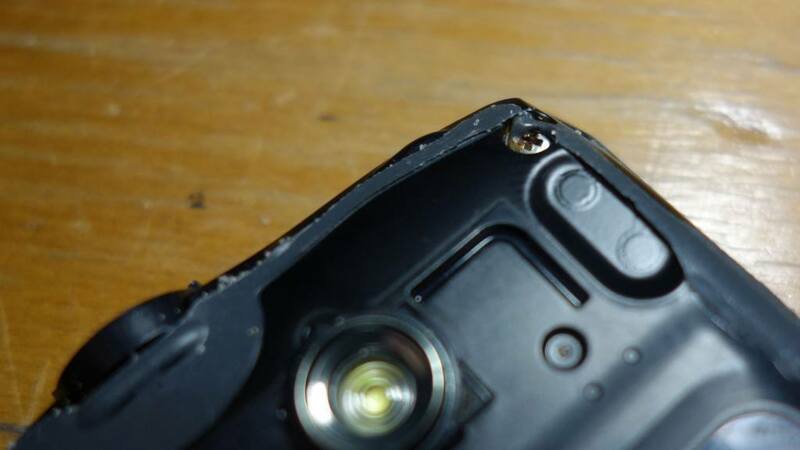 Yep, two of the three outer contacts where damaged. Actually the one in the middle-front is completely destroyed. 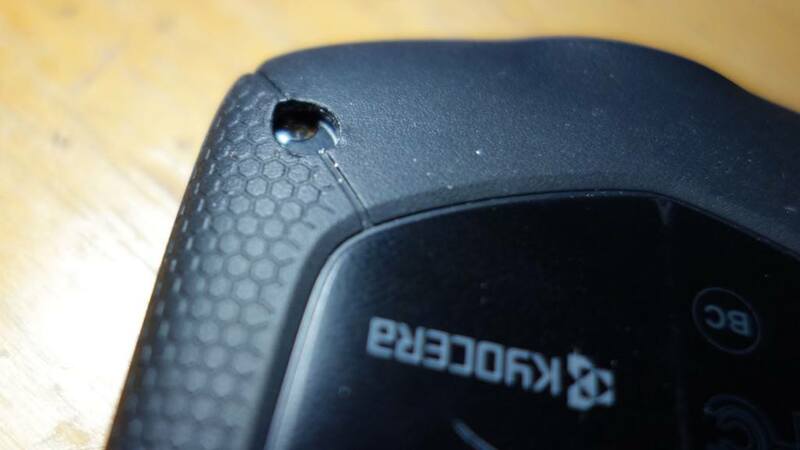 Bottom line: So much for ruggedness, Kyocera. 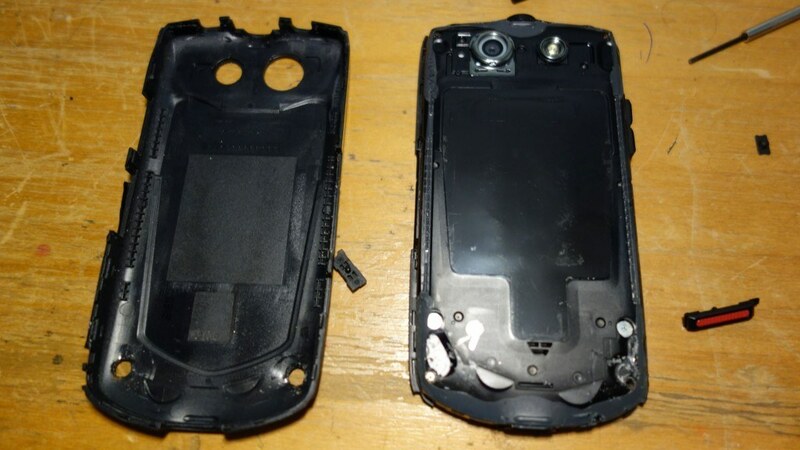 This Kyocera Phone has a nice “manly” outer shell, but water and sand actually gets inside the inner shell and starts rusting the screws in there. 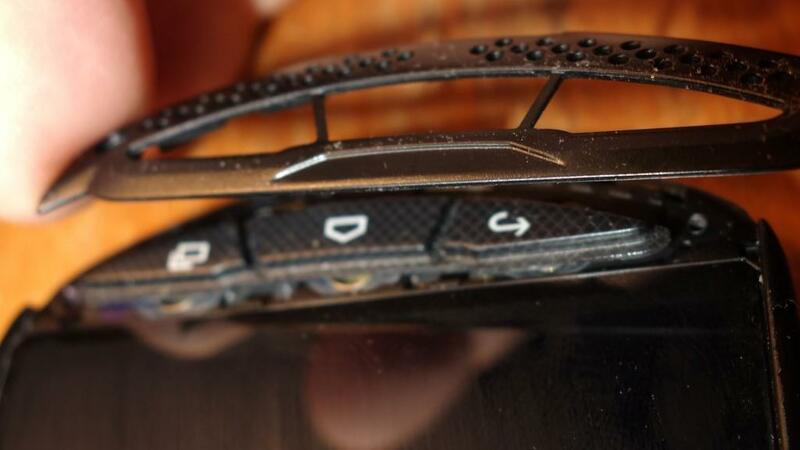 Also, I need to point out that there is a lot of GLUE used to seal the whole design in our Kyocera Brigadier phones. It felt kind of cheap. To add into the cheap side, that matte black finish your Kyocera Brigadier got, is just an easily scratchable elastic “paint”. The usual shiny black plastic will surface “in no time at all”. Before “upgrading” into the Brigadier, I did enjoy another water-proof phone, the Fujitsu F-01F (japan made, only for Japan Market, distributed by DOCOMO telco between 2012 and 2013). I did open the Fujitsu F-01F too, only to find and admire a vastly better engineered water containment system and phone in general. That Fujitsu was a really cool phone. For instance, there was no need to cover the micro USB or headphone connectors. I did have the misfortune to slip the Fujitsu phone into concrete floor, shattering the (Gorilla Glass 3) screen. This screen accident fueled my Kyocera Brigadier purchase. 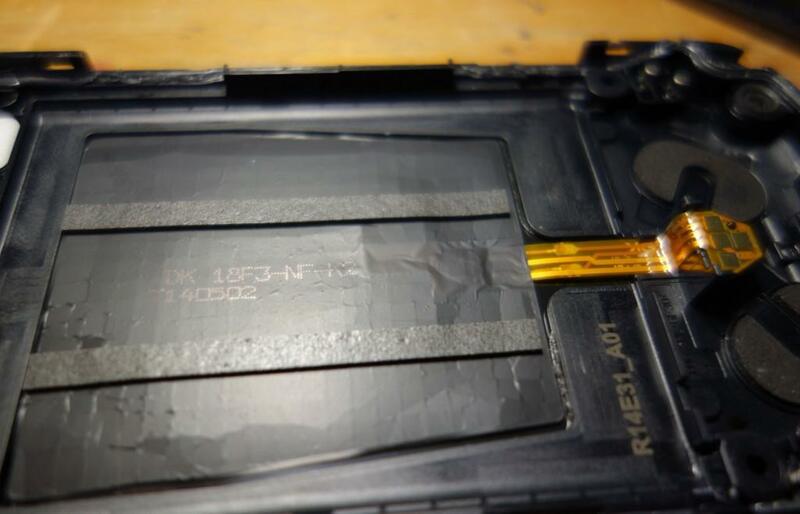 Now the screen is pure sapphire, but the Nano Sim Slot is pure crap and even the inner screws get rusted. Hopefully this story and pictures may be of use for you, reader. Me, I got 100% frustrated, as I lost 400 USD on my Kyocera Brigadier and could never actually use it.